In all my wishful thinking about ‘what I would do when I grow up’ as a child, NEVER did I think I would be maintaining a weblog on Indian food. OneLifeToEat was born out of a passion for good eating and a desire to share great recipes with friends. What started out as a pursuit of personal interest, is now much more. I write for OneLifeToEat’s readers and their encouraging comments and feedback, time and again. 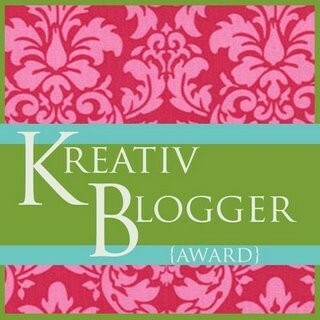 One such reader has truly surprised me with tagging me for The Kreativ Blogger Award. Sarah Melamed of Food Bridge included me in her list of 7 Kreativ Bloggers (scroll down to see the list). Thankyou Sarah! Sameera & Sabera, the authors of OneLifeToEat are flattered and honored! Read here for the origins and purpose of this award. 7. Leave a comment on each of the blogs to let them know they have been nominated. I was in the choir (Sopranos) in school. When I sing now my ears hurt because I’m so off-tune. I once followed a Bollywood Actor in Mumbai. I spotted him on the street while running an errand, and followed him for 3 blocks, before he entered another building. I learnt how to ride a bike at age 22. Yes. Age 22. The first time I successfully made something delicious was a few years ago – an omelet for my Father. My first paycheck was Rs. 400 (roughly $9 at current rates) for some copywriting I did for a website. I got my first job without an interview. I topped a test and was given the job. truthfully, the best part of the kreativ blogger awards is reading the list. I learned to drive at age 28, ridiculous if you think about it so learning to ride a bike at 22 doesn’t seem too strange to me :-). You are sending out the award to some very deserving bloggers. Glad to know you enjoyed reading the Blogs I’ve listed, Sarah! Does your husband still bug you and try to do ‘passenger-seat driving’ when you drive? 😉 Thanks for the comment and thanks for nominating me!